India and South Korea today signed a treaty on extradition and another treaty on mutual legal assistance in criminal matters and decided on a slew of concrete measures to give a mega push forward to their bilateral relations. 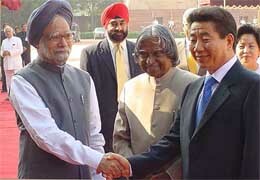 Prime Minister Manmohan Singh shakes hands with South Korean President Roh Moo-Hyun as President A.P.J. Abdul Kalam looks on at Rashtrapati Bhavan in New Delhi on Tuesday. Prime Minister Manmohan Singh has asked for a draft-core plan from the Ministry of Defence to make up for the delay in the finalisation of the Tenth Five-Year Plan and to maintain the tempo of modernisation, upgradation and procurement programmes of the armed forces. Electioneering hots up in Arunachal Pradesh. Bomb and bullets marked the opening day of the crucial student union elections of Lucknow University as one student was killed and over nine were injured in shoot incidents here last night. In a judgement that could provide substantial relief to Muslim women in matters of maintenance, the Supreme Court has allowed higher maintenance amount to a Gujarat woman under the amended Criminal Procedure Code. Although widespread rains have damaged standing crops in some areas, it is likely to improve rabi crop production significantly, experts said here today. Besides adding copious moisture to soil, these post-monsoon rains have reduced temperature. Seventy crore Indians don’t have access to a proper toilet, and have to relieve themselves in the open, Ms Kumari Selja, Union Minister of State, said here today. She was speaking at a function marking World Habitat Week. The international labour movement is at crossroads today and is being threatened by the “fly-by-night capital” and anti-labour attitude of the judiciary as well as mainstream political parties, said Ms Arundhati Roy, noted social activist, here today. Veteran CPM leader Jyoti Basu has admitted that the support to the Congress (I)-led UPA Government is due to certain compulsions, adding that there is no other alternative left to keep the BJP and other communal forces out of power. The Supreme Court today posted hearing for October 11 on an appeal by the Tamil Nadu Government, challenging the Madras High Court order for CBI investigation into allegations of “sleaze” by a woman against some politicians and top police officers of the state. Madhya Pradesh Chief Minister Babulal Gaur today sought a Central assistance of Rs 1400 crore for forest conservation, improvement of roads and for the project relating to bringing the Narmada waters to Bhopal. Naxalites want prohibition in Andhra Pradesh. Liquor ban, lifted during the Chandrababu Naidu regime, is one of the issues that the Maoist parties would like to discuss with the state government during the forthcoming peace talks. What started as a trivial staff-management row in one of the most high-end residential schools in the country has become a tiff gone wrong. The Department of Science and Technology yesterday decided to expand its Mapping the Neighbourhood project in 30,000 schools across the country. The government has decided to set up an expert group to study and verify the data collected by the HIV sentinel sites across the country after questions were raised by the Global Fund for HIV/AIDS, TB and malaria on the official figure of 5.1 million HIV/AIDS patients in India. The British Government today said it would step up its support for India’s efforts in curtailing the spread of HIV/AIDS and launched a new global strategy for tackling the pandemic. The Left unity has started firming up ahead of the Assembly elections in Bihar with the host of leaders of the CPI, CPM and other Left parties participating in the two-day seventh CPI-ML (Liberation) state-level conference, which ended here today. Former Prime Minister VP Singh along with 171 of his supporters, was detained this morning by the police while leading a march of Delhi manufacturers towards the Prime Minister’s residence. The Centre has revoked the suspension of a former Director in the Ministry of Home Affairs Thomas Mathew, who along with three others were booked by the CBI under the Official Secrets Act for allegedly leaking certain documents to web portal Tehelka. The Congress President, Mrs Sonia Gandhi, today accused the NDA Government of making empty promises “but did little to implement them.” Addressing a series of election rallies in Maharashtra, Mrs Gandhi said her government’s predecessor did not do enough for the poor. “They indulged in a lot of big talk but did little to provide succour to the poor and the downtrodden,” Mrs Gandhi said. Mrs Gandhi’s rallies in Vidarbha, Marathwada and Western Maharashtra have been receiving a good response, according to reports. Senior party leaders, including Chief Minister Sushilkumar Shinde, Union Home Minister Shivraj Patil, MPCC chief Prabha Rau and AICC General Secretarty Margaret Alva have been accompanying Mrs Gandhi at her rallies here. She addressed her last election rally in the state by sharing a platform with NCP chief Sharad Pawar at Nashik in western Maharashtra. For once workers of the two parties seemed to have buried all differences and joined hands for a successful rally. Depending on the electoral composition of the constituency, Mrs Gandhi has been hitting out at communal forces. At a meeting in Yavatmal in eastern Maharashtra, Mrs Gandhi noted that the previous Shiv Sena-BJP alliance Government in Maharashtra had meted out injustice to the poor and backward sections of society. She went on to say that the Congress, the NCP and the Republican Party of India (Athwale) had come up with a joint manifesto to fight communal forces in the state. 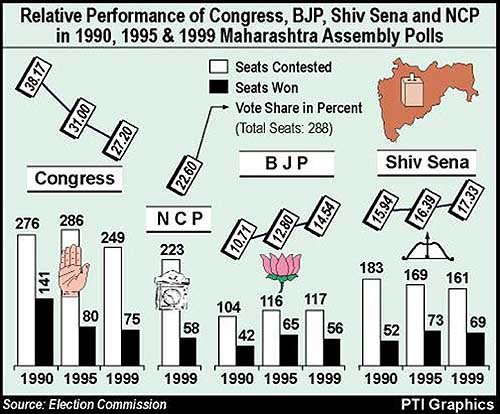 According to Congress sources, it is targetting the Vidarbha region with 60 seats in the Maharashtra Assembly. Mrs Gandhi kicked off her election campaign in Maharashtra from Nagpur yesterday. Party workers have hit the streets in an attempt to counter the impact of the Shiv Sena-BJP combine which grabbed 10 of the 11 Lok Sabha seats in last May’s elections. The Congress is making an all-out effort to win over the local tribal and Dalit population which seems to be switching over to the Bahujan Samaj Party. Mrs Gandhi’s meetings were held in three tribal dominated areas – Paoni and Gadchiroli bordering Andhra Pradesh and Dhamangoan bordering Chhattisgarh. Mrs Gandhi also addressed a meeting at Amravati, the centre of Dalit politics in the state. The R.S. Gavai faction of the RPI is contesting two seats in alliance with the Congress-NCP-RPI (Athwale) grouping. Prime Minister Manmohan Singh will address a series of public meetings in Maharashtra on Saturday ahead of the October 13 Assembly poll. During his day-long whirlwind tour of the state, Dr Singh will be addressing public meetings at Dhule in north Maharashtra, Akola in Vidarbha and Nanded in the Marathwada region, MPCC spokesperson Anant Gadgil said here. “In Uttar Pradesh, too, we had to fight it out alone. In that state we fought elections in alliance with the Congress and the BSP votes were transferred to the Sonia Gandhi-led party. But the Congress votes went to other “Manuvadi” parties” instead of the BSP,” the former Uttar Pradesh Chief Minister said. Taking a dig at “Manuvadi” parties, including the Congress, she stressed that the BSP was not against any religion or caste. “We are against ‘Manuvad’,” she asserted. Ms Mayawati alleged that backward classes and economically deprived people did not get justice and quotas reserved for them remained unfulfilled because both the Central and the State Governments were controlled by ‘Manuvadis’. She promised reservation for the SCs/STs and backward classes in private sector and judiciary if the BSP came to power at the Centre. The Dalit leader also promised reservation for the poor among upper castes and Muslims. She reiterated her party’s stand to carve out a separate state of Vidarbha in East Maharashtra and name it after Babasaheb Ambedkar. The Akhil Bharatiya Jana Sangh, led by Prof Balraj Madhok, today criticised the BJP for putting up its candidate against Ms Hemani Savarkar, daughter-in-law of Veer Savarkar, from the Pith Assembly constituency in Maharashtra. In a statement Jan Sangh General Secretary Prafull Goradia, a former BJP Rajya Sabha MP, said the BJP should not have done anything to divide the Hindu votes by encouraging “intra-Hindu” contests. Mr Gordia, who was the editor of the BJP’s official magazine, mocked at the BJP agitation led by former Union Minister Sushma Swaraj at Port Blair for the restoration of a plaque containing the quote of Veer Savarkar in the Swatantra Jyoti in Cellular Jail. The BJP flew hundreds of protestors to the Andaman Islands but their decision to field candidate against the daughter-in-law of the freedom fighter had exposed the BJP’s “insincere attitude,” he said. These decisions were taken during the day-long talks today with South Korean President Roh Moo-Hyun with the top Indian leadership on the second day of his three-day State visit to India. l To step up efforts to take bilateral economic partnership to a higher level. Both sides agreed to set a target of $ 10 billion for bilateral trade by 2008.
l To conclude at the earliest an agreement on cooperation and mutual assistance in customs matters. l South Korea to upgrade its office in Mumbai to a Consulate General at an earliest possible date in 2005.
l A "Korea week" to be organised in India in November 2004 and a corresponding "India week" in South Korea in September/October 2005.
l A joint statement on collaboration in information and communication technology was signed. l To further promote exchanges and interaction in the defence field, including cooperation between the two Navies, coast guards and related agencies of the two countries in areas like anti-piracy and search and rescue operations. l To establish a joint study group, composed of government officials, economists and representatives of business community, to take a comprehensive view of the bilateral linkages in trade, investment and services and to come up with concrete suggestions on expansion of economic engagement. The JSG to start its work latest by January 2005 and submit its report within one year. The extradition treaty and the treaty on mutual legal assistance in criminal matters were signed by External Affairs Minister K Natwar Singh and the South Korean Minister of Foreign Affairs and Trade, Mr Ban Ki-Moon in the presence of Prime Minister Manmohan Singh and the visiting South Korean President Roh Moo-Hyun. The treaty on mutual legal assistance in criminal matters provided for a wide measure of mutual cooperation between India and South Korea for prevention, investigation, prosecution and suppression of crime falling within the jurisdiction of the two countries. Under the extradition treaty, any offence committed inside or outside the territory of one party-and which was punishable at the time of the request, with imprisonment for a period of at least one year under the laws of both countries-would be an extraditable offence, irrespective of the category or denomination of the offence. Offences of purely fiscal nature would also be extraditable. Offences committed outside the requesting country would also be extraditable offences, if they were punishable in the requested country. The treaty would provide the necessary legal framework for seeking extradition of fugitive offenders, including those who might be wanted in respect of economic offences. It would work as a deterrent for criminals and would help reduce criminal activities with international ramifications. South Korean President Roh Moo-Hyun today held extensive discussions for over one and half hours with Prime Minister Manmohan Singh on a wide range of bilateral, multilateral and global issues. External Affairs Minister K Natwar Singh had called on him earlier in the day. President A P J Abdul Kalam hosted a banquet in honour of the visiting dignitary. Vice-President Bhairon Singh Shekhawat called on President Roh this afternoon. 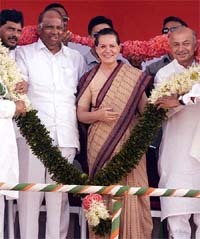 Chairperson of UPA Coordination Committee Sonia Gandhi would call on President Roh tomorrow morning. Prime Minister Manmohan Singh has asked for a draft-core plan from the Ministry of Defence to make up for the delay in the finalisation of the Tenth Five-Year Plan and to maintain the tempo of modernisation, upgradation and procurement programmes of the armed forces. The draft plan will include a non-core portion also. This direction was given at a top-level review meeting on defence matters held in New Delhi today which discussed the gamut of security-related issues, including defence preparedness. The meeting was chaired by the Prime Minister. The Defence Minister, Mr Pranab Mukherjee, the Chairman of the Joint Chief of Staff Committee, Air Chief Marshal S Krishnaswamy, the Chief of the Army Staff, Gen N.C. Vij, the Vice-Chief of the Naval Staff, Vice-Admiral Yashwant Prasad, Defence Secretary Ajai Vikram Singh, National Security Adviser J.N. Dixit and Special Adviser to Prime Minister M.K. Narayanan were present at the meeting, which lasted about 90 minutes. According to the Defence Ministry spokesman, the Prime Minister has desired that as regards the procurement of defence hardware, the decision-making should be expedited. The Defence Minister has already ordered review of the existing procurement policy at the Secretary level, after which it will be reviewed by the Defence Minister. Prime Minister Manmohan Singh today said a review of media policy was imperative in context of changes consequent to the information revolution and the process of opening of the Indian economy. Delivering a 15-minute keynote address at a function held here this evening to mark the 10th anniversary celebrations of the Indian Women’s Press Corps, Dr Singh said greater professionalism could be ensured in media by allowing the winds of competition to blow freely. “We need to ensure that there is a suitable framework for freedom of competition to be meaningful for all players in the media sector”. Dr Singh drew attention to the recently constituted Group of Ministers on Media Policy to advise the government on how to create a fair and balanced policy framework. He said his government welcomed the possibility of discussing the policy towards investment in the media with representative bodies such as the IWPC. Describing the 10th anniversary as a useful milestone to pause and reflect on the media’s journey over the past decade, Dr Singh observed that our media still had some distance to traverse to ensure genuine gender equality. He assured the gathering of his government’s commitment to ensuring gender equality in the job market and enforcing rules to prevent offensive representation of women. The Prime Minister said although politicians did not necessarily relish media criticism, they looked foward to the continued interaction between the government and the media as it characterised a healthy democratic society. In her welcome address, IWPC President Sushma Ramachandran traced the journey of the IWPC and its progress despite various hurdles and hardships. She also announced the creation of a non-lapsable corpus, initially of Rs 25,000, to help senior women journalists facing financial crisis. Contributing to the glitter of the occasion were Pakistan High Commissioner Ashraf Jehangir Qazi, Minister of State in the PMO Prithvi Raj Chauhan, honorary president of the Inter-Parliament Union Najma Heptulla, former Captain of the Indian cricket team Bishan Singh Bedi, former leader of the Samata Party Jaya Jaitley, Deputy Head, Press and Public Affairs, British High Commission Kitty Tawakley and the Chairperson of the National Commission for Minorities Tarlochan Singh. During the filing of nominations yesterday, student groups opened fire on each other frequently and clashed to prove their supremacy. Manish Rai(26) was shot dead late last night when rivals fired upon him near Butler Hostel of Lucknow University. SSP Kamal Saxena told UNI here today that the situation was tense but under control. More policemen have been deployed near the student hostel, he said, adding that if situation demanded the authorities might go inside the hostels in search of the criminal elements. Meanwhile, nine students received bullet injuries when two groups opened fire on each other at Shia College yesterday during the filing of nominations. After the murder of Manish, supporters of a particular candidate ransacked several vehicles near King George Medical University (KGMU). They even tried to manhandle the Procter of Lucknow University and gheraoed District Magistrate Aradhana Shukla and the SSP. The student leaders yesterday came to file their nominations in long processions leading to traffic jams in most parts of the state capital, violating the High Court’s directive. In a judgement that could provide substantial relief to Muslim women in matters of maintenance, the Supreme Court has allowed higher maintenance amount to a Gujarat woman under the amended Criminal Procedure Code (CrPC). She had claimed that she was entitled to higher maintenance amount in view of the rising cost of living as the amended CrPC provision provided such right to her. Upholding the enhancement of the maintenance of Ghasura Mumitazbanu of Dessa in Gujarat by a trial court there from fixed the amount of Rs 500 to Rs 2,244, a Bench of Mr Justice P.V. Reddi and Mr Justice Tarun Chatterjee said she would be entitled to claim it from March 1, 2003. The apex court made some modification in the trial judge’s order, which had allowed increased maintenance to Mumitazbanu from May 9, 2002, when she had filed an application before the court. Her counsel had stated that under the amended provisions of Sections 125 and 127 of the CrPC, she was entitled to increase the maintenance amount, which was fixed as per the earlier unamended provisions of these sections after her husband had married another woman. The maintenance amount was initially fixed at Rs 450, which was increased to Rs 500 in 1999 by the trial court. The first class Magistrate at Deesa, had allowed her application under the amended Section 125 in view of the changed circumstances, hike in prices of essential commodites and increase of her husband’s income. It may be recalled that almost identical ruling by the Supreme Court in the Shahabano’s case during Rajiv Gandhi’s regime, had snowballed into a major controversy after Muslim leaders had raised hue and cry over the grant of maintenance to her under Section 125 of the CrPC. This would help the growth of rabi plants, agricultural experts who attended the crop weather watch group meeting said. This could be seen as a good news as the first advance estimates had stated that the kharif foodgrain output was likely to decline by 10.46 per cent to 100.29 million tonnes in 2004-05 from 112 million tonnes last year. The government hopes to make up the shortfall in the rabi season and several measures are being taken to increase rabi output. The group, which met under the chairmanship of Additional Secretary R.S. Pandey to take stock of crop prospects, input supply position and weather conditions in the last week, has been informed that despite drought productivity of paddy and cotton in kharif this year has been satisfactory in irrigated areas such as Punjab. The rains, according to Indian Meteorological Department reports, have occurred in all parts of the country except central India. Rains have been particularly good in coastal areas of Andhra Pradesh and Orissa. Rains in the monsoon season, which ended on September 30, were below normal by 13 per cent, with as many as 13 out of 36 meteorological subdivisions receiving deficient rains. The group was also informed that reservoirs throughout the country are full by more than 80 per cent of the average except in Himachal Pradesh, Uttar Pradesh and Uttaranchal. The total live storage in 71 important reservoirs in different parts of the country was 84.58 billion cubic metre (bcm) on October 1. This was 6.82 bcm more than last year’s position on October 1, and 10.09 bcm less than the average of past 10 years’ storage. Taking note that adequate quantity of seed and fertilisers are available for the rabi season, the group has decided that fertiliser availability will be rigorously monitored in the coming months to avoid localised shortages. She said there wee 260 crore such people in world. “Defecating in the open is a serious threat to public health as it contaminates vital water sources and causes a number of diseases like typhoid, enteric fever, gastro-enteritis and cholera, to name only a few. It is a major cause of child death in South Asia,” she said. She quoted a World Bank report that lack of access to sanitation leads to a loss of 4 per cent of India’s GDP which comes to around 16-billion-dollar. she reiterated the government’s commitment to extending sanitation and clean water to at least half the number of deprived people by 2015. India is a signatory to the Johannesburg summit resolution of 2002 which had made this pledge. The celebration was organised by the NGO Sulabh International whose founder Dr Bindeshwar Pathak announced the foundation of Sulabh International Academy of Sanitation. Ms Selja laid the foundation stone of the academy which would impart short-term training to professionals, including engineers, doctors, sanitation experts, sanitary officers, architects, planners, administrators etc from India and abroad. It is planned that students fresh from colleges and universities desirous of pursuing a career in sectors relating to environment, water, sanitation, health and hygiene etc will undergo a course extending to two years during which they will be made conversant with the problems faced in these spheres. A six months course is planned for students who have done graduation and can afford to pursue these courses. Dr Phatak said Sulabh technology was adjudged among the best practices in Istanbul in 1996, winning the confidence of the UN. This helped them extend their programmes to Bhutan, Afghanistan and and parts of Africa. “Our approach is first to develop a technology which needs no manual scavenging and, second to educate and rehabilitate the liberated scavengers in other vocations after training and education,” he said. Sulabh technology also leads to water conservation. “The water requirement is two litres against 10 litres in the conventional flushing system. It leads to saving of 8 litres for every use”, he claimed. Similarly, the waste generated per person per year is nearly 40 kg. If through this technology, the saving is applied to nearly 70 crore people it would amount to saving of nearly 30,000 tonnes of waste per annum leading to production of colossal amount of organic fertilizer. Based on this technology, Sulabh has set up over a million household toilets and more than 6,000 community toilet complexes all over the country. “ It is an irony that majority of activists are today mired into court cases, and have even been branded as anti-nationalists, terrorists by the present regime despite the fact that they are fighting for the rights of millions of adivasis, landless labourers and peasants,” said Ms Roy. She was speaking at the convention on “ Labour struggles for justice” organised by the Solidarity Group for Chhattisgarh Workers’ Movement in the memory of renowned trade unionist late Shankar Guha Niyogi, who was murdered on September 28, 1991, in Chhattisgarh. Referring to the role of SC in the Mumbai slum eradication and order of closure of thousands of industries in Delhi in the name of checking pollution, she lamented that a number of judgments were coming against the interests of workers. Ms Jaising wondered whether the situation was better during pre-Independence era as far as compensation to the workers were concerned, for instance, in Workman’s Compensation Act-1923. “The most progressive law after independence, Industrial Disputes Act, only talks of setting up machinery to resolve the disputes and not compensating the workers,” she said. “ Our new slogan is ‘Trishul Naheen, Talwar Naheen, Kaam Ka Adhikar Chaheye’ (No trident nor sword, we want right to work). At a time when millions of people are facing severe drought, fall in income, water scarcity and other problems, how could the governments be allowed to follow the agenda of world financial institutions,” she said. She added the verdict of the people in the recent Lok Sabha elections was just a beginning and the social activists and movements would have to prepare themselves for long struggle and constructive approach. “ We have an historical opportunity to reverse the trend. Proposed Employment Guarantee Act (EGA) of the government will set an example for the international economy,” she said, adding that India could become another Argentina or Turkey if the government tried to follow the World Bank and IMF agenda. Ms Sudha Bhardwaj, secretary, Chhattisgarh Mukti Morcha, asserted that despite threats from different interest groups they would continue their struggle for rights of workers and peasants in Chhattisgarh. Speaking at a meeting at Promode Dasgupta Bhavan on the occasion of the birth centenary of Comrade A.K.Gopalan, one of the party’s founders, he advised the party workers to fulfil the incomplete tasks of the late leader which would be their right tributes to him. An important politburo member, Mr Basu felt that the present leadership was not moving in the right direction which often created a wrong impression among the people about the party’s ideological vis-a-vis political stand on some major issues. He argued that it was a political compulsion which was forcing them now to support the bourgeois Congress (I) which many people in the party were reluctant to accept. Earlier, talking to columnist Tarun Ganguly on Channel Vision, the Marxist leader alleged the party had again committed a blunder by not joining the UPA Government. He said they could not persuade others to accept the proposal for joining the UPA Government and their proposal was voted out by 50 members while only 13 voted in their support. Mr Basu said in 1992, the offer of prime ministership was turned down by seven members though six were in favour. It was a historic blunder to reject the offer of prime ministership which the leadership later came to realise. The party would also realise the mistake committed by not joining the UPA Government. The 91-year-old leader lamented that these days they (himself and Surjeet) did not have much say in the party. He alleged on several occasions what they wanted could not be carried out and it was the hardliners (naming Prakash Karat and others) who dominated. A Bench, headed by Chief Justice R.C. Lahoti fixed the date for hearing after Tamil Nadu Government counsel made a special mention of the filing of the appeal. The allegations by Sivakasi Jayalakshmi about her “intimate relations” with certain top politicians and senior police officers had created ripples in the state. The high court ordered a CBI inquiry into the matter after Jayalakshmi’s father had filed a petition before it, alleging that his daughter had gone missing and he apprehended that some powerful persons, including certain police officers, were involved in it. But Jayalakshmi had surfaced after some days, and made the allegations before the media against some politicians and the police officers about her “intimate relations” with them and her “exploitation” by them. Aggrieved by the high court order, which has caused a lot of embarrassment to the state administration, the Tamil Nadu Government has filed an appeal for its quashing in the Supreme Court. This request was made by Mr Gaur during his meeting today with Deputy Chairman of the Planning Commission Montek Singh Ahluwalia here. Mr Gaur also hoped that the Central Government would help the backward state of Madhya Pradesh by amending the current formula of Central assistance (70 per cent loan and 30 per cent grant) to 50:50 ratio. He also hoped that Central assistance for the Sarva Shiksha Abhiyan would be cent per cent. Mr Ahluwalia agreed with most of the points raised by the Madhya Pradesh Chief Minister and decided to convene a special meeting of Chief Ministers of the Northern States to discuss these very issues, a press note from the Madhya Pradesh Information Centre said here. He also assured the Chief Minister that forest conservation, Bhopal Narmada Payjal Yojana and improvement of roads would be dealt with on a priority basis. Banning Bacchus and forming a separate state for the backward Telangana region are among the demands put forward by the revolutionary parties to the state government. Emissaries of the two prominent armed Naxalite parties in the state, the PWG and Janasakthi, today met Home Minister Jana Reddy to discuss the modalities for the proposed talks and handed over a letter detailing the agenda for the dialogue slated for October 15. For the first time in the history of ultra-left movements in the state, the peace talks will take place between underground leaders of the armed guerrilla groups — the PWG likes to call itself as CPI-ML (People’s War) party — and government representatives directly. In the first phase of the talks, emissaries of the PWG and Janasakthi interacted with the Home Minister and paved the way for the proposed face-to-face talks. The 11-point agenda spelt out by the Maoist parties includes the lifting of cases against their leaders, activists and sympathisers, distribution of land among the landless, protection of the rights of the tribal people, providing reservation to Muslims and a discussion on economic reforms. Mr Jana Reddy, who agreed to the request of the emissaries to hold the talks in Jubilee Hall instead of the government secretariat, also assured that the top Naxalite leaders, Ramakrishna, Ganesh and Sudhakar, who were to participate in the negotiations would be provided safe passage during the period of talks. What started as a trivial staff-management row in one of the most high-end residential schools in the country has become a tiff gone wrong. Trouble brewing on the school’s serene campus has made life at Welham Boys School not so smooth. Over hundred of the school staff members have gone on an indefinite strike and are threatening to agitate over the issue of the replacing the school’s old-time “dhobis” with private laundry machines. The school’s management has sought intervention of the district administration to sort out the alleged threats of kidnapping and harassment of students by some of the staff members on strike. The issue has taken an ugly turn with the management and staff members swapping allegations of threats and harassment. Even as dharnas and protests have been order of the day at the school for a month now, the problem is now taking a serious turn. Nine “dhobis” working for the school for over 30 years were sacked in July after a notice when the school switched to the new laundry at the insistence of parents, the school authorities said. Despite being assured of an alternative job by the school, the “dhobis” went on strike with their families. The non-teaching staff union of the school has also been on a strike with the “dhobis” for over a month now. About a fortnight back the school suspended four non-teaching union staff members for arranging dharnas and raising slogans to vitiate the atmosphere, the school authorities said. The school’s management, which has failed to handle the issue for over a month now, has sought intervention of the district administration. “We have reported the matter to the district administration and the school is keeping the officials posted of the developments,” said Principal Dev Lahiri. The Department of Science and Technology yesterday decided to expand its Mapping the Neighbourhood project in 30,000 schools across the country. Calling it national mission mode, Union Minister of State for Science and Technology Kapil Sibal said the decision followed President A.P.J. Abdul Kalam’s desire to implement the project all over the country. The pilot project, jointly initiated by the Department of Science and Technology, the Department of Space and the Centre for Spatial Database Management and Solutions, an NGO, was launched in 2003 in 10 schools of Almora in Uttaranchal. Yesterday 30 young geologists out of the 250 students from Classes VII to XI, who participated in the project, demonstrated their mapping skills using mobile mapping techniques, personal digital assistant (PDA) and global positioning system (GPS). Talking to The Tribune, Mr Sibal said the data collected by the children could be used for development and solving problems in their neighbourhood. He said the data could be upgraded and made a part of the database for the National Spatial Data Infrastructure, which was almost in its final stage of approval. After the Cabinet gave it a nod, the framework for the infrastructure would be finalised as strategic and business plan had already been accepted in principle by most of the 25 to 30 government-based data producing agencies, that had agreed to be a part of the project. The vast database, based on common minimum acceptable standards of all agencies, would be accessible to on the Internet. A top-level committee would be the decision maker about the standerdisation process. The National Mapping Policy was also in its final stage, waiting for an approval by the committee of secretaries Mr Sibal added. He applauded efforts of young geologists from Almora, calling it a wonderful exercise, undertaken by the technologically savvy children. “The project is all about empowering children. If we invest in the children today, I can assure you they will take the country forward,” he said. Armed with global positioning system (GPS), geographic information system (GIS) and space imagery incorporated in palm-held computers, the young geologists had created maps with neighbourhood details to understand immediate environment and show how mapping could, after all, be a child’s play. With these maps, they now hoped to find solutions for the regeneration of fast-disappearing natural sources such as water, improving road connectivity, finding better locations for electricity and water distribution points, reducing traffic congestion and improving system of garbage collection. For youngsters the Maulik Kandpal, Lalit Mohan, Kailash Singh Bhakuni, Suraj Singh Fantiyal, Daya Mehra, Yamini Joshi, Dheeraj Singh, Yogesh Mehta, Sanjay Mehta and Shivani Mehta, who were part of the team representing 10 schools, it was an experience they would like to continue and hopefully make a career of out of it. Even though most of the children were good in geography (which was why they were selected), the initial confusion regarding how mapping could be done without a pencil and a paper and with the GPS and the GIS was only but natural. Over a period of time they learnt to use the devices and now hoped to now use their knowledge to investigate socio-economic, environmental and ecological issues in their neigbourhood. Handling the sophisticated technology with complete ease after one and a half years today, some of them wanted to continue in the field and become geologists. Talking to reporters here, Health Secretary J.V.R. Prasada Rao without directly naming Global Fund chief Richard Feachem, criticised him for creating a “scare” by his statement that India had the largest number of HIV/AIDS cases and the official figure did not indicate the true picture. “The HIV/AIDS data collected by the National AIDS Control Organisation is in public domain. Anyone can examine it and if they have any doubts they can discuss it with us. By questioning the authenticity of this data at the national and international level, they are actually harming the National AIDS Control Programme which is really tragic,” Mr Rao said, addressing the launch of UK’s Global Strategy on HIV/AIDS here today. About Dr Feachem’s claim during his recent visit to India that it had overtaken South Africa in terms having the largest number of HIV/AIDS patients and the official data was based on inadequate sentinel survey sites, Mr Rao said the AIDS map of the country was complete with sentinel sites in every state. “However, to dispel any doubt about the data collected by NACO, we have decided to constitute a group of epidemiologists who will go through the data based on blood samples collected from various parts of the country and give their opinion. The group will also have epidemiologists from international bodies,” Mr Rao said. He said a meeting would be held tomorrow to review the performance of the National AIDS control programme and redraw the strategy for the future. It would also focus on giving more priority to highly vulnerable states like Bihar, Uttar Pradesh and Rajasthan which, though at present have low HIV prevalence rate, could face a major disaster in future if the the prevalence rate increased. Asserting that the Indian government, people and political leadership was committed to the HIV/AIDS prevention programme, he said this was evident from the fact that AIDS control had been mentioned in the Common Minimum Programme of the UPA government and Prime Minister Manmohan Singh’s assertions on HIV/AIDS programme. The leaders spoke with a renewed resolve to ‘save’ Bihar with their combined efforts. The Left unity has become pronounced with the party members sinking their ideological differences to corner the state government despite the CPM being an ally of the ruling RJD. CPI (ML) General Secretary Dipankar Bhattacharya, in his address to the open session, stressed the need for the Left unity. He offered his party’s all-out effort for achieving the goal. Mr Singh, leading the protesting factory owners, was detained at the Rajiji Marg at around 11.30 a.m. as he was heading towards the 7, Race Course, DCP, New Delhi, Anita Rai said. He was, however, later released. Earlier, the factory owners had gathered at his house on the Teen Murti Road. The former Prime Minister has, of late, been actively espousing the cause of factory owners in non-confirming areas of the Capital who allege that their units were being arbitrarily closed by the authorities in the name of complying with the Supreme Court order. Mr Mathew, who had joined the ministry yesterday has not been assigned any posting so far, sources said here today. Mr Mathew alongwith Section Officer Neeraj Kumar and Tehelka journalists Anirudh Bahal and Mathew Samuel were chargesheeted last year. The CBI had claimed that Mr Kumar, Mr Mathew, Mr Bahal and Mr Samuel allegedly entered into a criminal conspiracy to obtain secret documents which were exhibited on the website, “tehelka.com” in 2000.